THIS CAME FROM A WIFE OF AN AFFLUENT AFRICAN DIGNITARY -BUT I CANNOT PROVIDE DOCUMENT PROOF-. IT IS A STATUS SYMBOL OF CULTURE AND AFRICAN HISTORY AND ICONS. I WAS TOLD SHE HAD THIS MADE FOR HER, AND TOOK MANY MONTHS TO COMPLETE. the DYES ARE STRONG AND RICH- AND THIS HAD NOT BEEN WASHED- HOWEVER, IS NOT DIRTY, NOR DOES THIS SMELL AS VINTAGE ITEMS WILL OFTEN BE STORED IMPROPERLY. 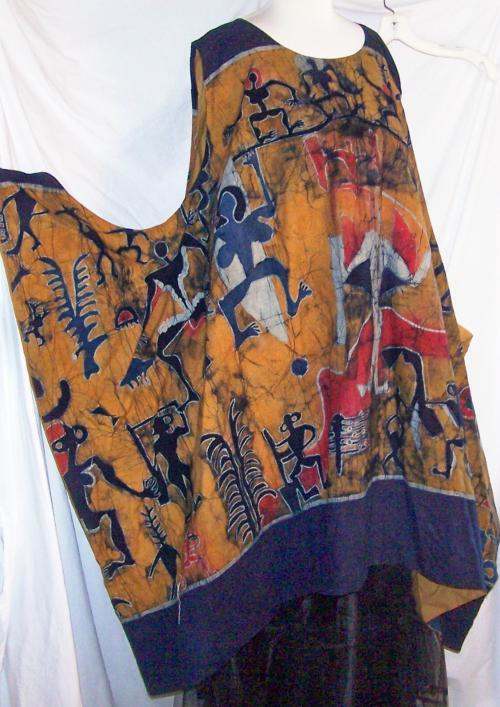 WORE THIS WHEN OUR CITY HOSTED A REAL AFRICAN DANCE AND HISTORY GROUP.iT WAS WORN TO THE DINNER AND LATER THEIR PERFORMANCE. YOU BET I GOT TO MEET THEM ALL! AND THEY WERE THE MOST WONDERFUL GROUP OF YOUNG AND ELDER TALENT, AND RECOGNISED THIS AS AN HONOR TO THEM- WHICH IS WHY I PAID A COUPLE OF THOUSAND FOR IT!